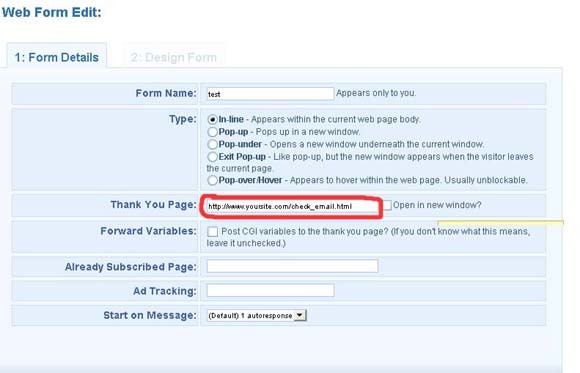 I will now show you how I use Aweber to set up my Boomerang List Builder Opt-in form. If you follow these steps you should be up and running in just a couple of minutes! The first thing to do is create a new list, this list will collect all subscribers that you receive from my Boomerang List Building software. To start, log into your Aweber account and click on the "Add New" link. The next step is to set up your "Verified opt-in" page. This is what the subscriber will see when they are asked to confirm their email address. I personally send the user to the code page (thanks.html or thanks.php if you are using my templates) as soon as they click on the confirmation link in the email but you can send the code via email if you prefer. If you wish you can then change the email that is sent out asking the subscriber to verify the email address, but the main thing I want to do is go to the bottom of the page and change the "Confirmation Success Page". Once you have done this, click on the green save button. Step 3 is simply to set up your opt-in form. You can set this up as you would a normal opt-in form, the only thing I have included here is I have changed the thank you page go to a custom page of my own, telling the user that they must check their email and confirm before they receive their code but this is 100% optional.